The FIDO, or Facilitating Interactions for Dogs with Occupations is a device for improving communication between working dogs and the humans they assist, including canines that serve as guide, hearing, service, skilled companion, search and rescue, and police dogs. Incredibly, the FIDO works as a wearable computing device to help assistance dogs communicate more directly with their handlers. It allows them to send messages via devices like Google Glass. 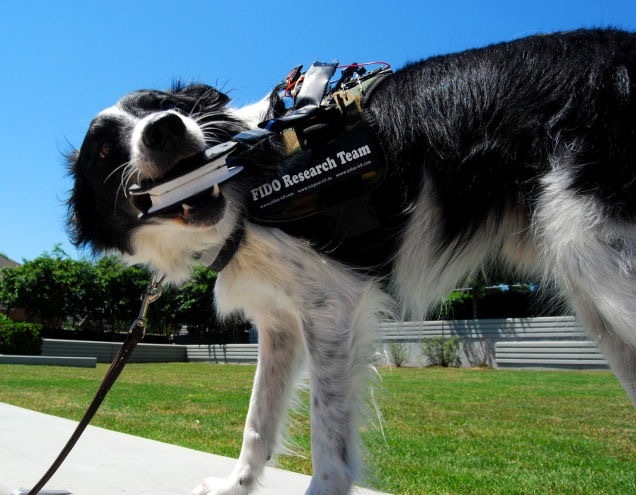 To create an interface device for the dogs, the researchers are creating sensors that the canines can trigger by tugging, biting, and using their noses. Currently, the developers have only tested one sensor per vest for research purposes, but their long term goal is to have a single wearable item equipped with multiple sensors, each of them capable of wirelessly transmitting data to a mobile phone or augmented reality device like Glass. This entry was tagged cyborg, dogs, research, science, tech, wearables. Enter your email address to subscribe and receive notifications of new discoveries by email.